Also i was VERY interested to hear you talk of ATARI NOT WANTING Eclipse's Falcon Space Game!. Wonder if anyone ever pushed him on why Atari suddenly decided it wasn't great enough to be what they wanted?. I would strongly recommend checking out the ANTIC podcast's interview with Bob Brodie, who was Atari's Director of Communications. He has surprising (well, to me) insight on why Atari exited the computer market. I need to find some way to include mention of this interview in an upcoming episode of the Atari Jaguar Game by Game Podcast; it's pretty significant. So with the Jaguar now serving as the basket for all their eggs, Atari wanted Jaguar games more than they wanted Falcon games, and since the Jaguar already had an abundance of space(-ish) games on the lineup, Atari wanted something different, and we got Iron Soldier (yay!). That's the impression I got from Eclipse interviews like this and this, both included in the show notes for the Iron Soldier episode. Thank you for the kind words, Lost Dragon. It was a lot of work putting that episode together, more so than any previous episode, but I'm pretty happy with how it turned out. There are things I forgot to mention, though, like who wrote the music (Bobby Prince! ), how long the songs are (the intermission theme is surprisingly the longest), how there's a volume control in the Options screen, and how when you die, you turn to face the monster which dealt the killing blow (even following it around the screen after you die). These are the types of things that come to me when I'm around 80% done editing. I'm pretty good at editing, but there's only so much I can do. Just yesterday I downloaded a demo of the new DOOM for the PC. I haven't tried it out yet, and I'm not sure when I will, but from what I've seen, it does seem to be more of an attempt to re-capture the guns-blazing feel of the original DOOM, as opposed to the spooky jump-scare environment of DOOM 3. I was surprised in 1993 when I saw the DOS shareware version took up TWO floppy disks. The new DOOM demo would take about 4,500. DOOM is an epic episode. Amazingly, its more info packed than the Wolf3D episode. Great job! Episode 15 for Dragon: The Bruce Lee Story is now available directly, on iTunes, Stitcher, Google Play, or your favorite RSS podcast app. Thank you for listening, and for your patience. In the next episode, we'll be platforming in the Nth Dimension with Zool 2. If you have any feedback for this one, please post here, or send it in (text or audio) to jaguar@gamebygamepodcast.com. Thank you, Lost Dragon. Out of curiosity, what did games for the CD32 cost at the time? This would be a good data point for my next episode. Atari was mostly interested in getting titles on the shelves, as well as filling gaps in the Jaguar lineup (this is more true for sports titles than fighting games, but either way). I like to think of this in terms of the app store wars. Apple and Google and Microsoft would announce how many apps they had in their respective app stores, nevermind the quality of or overlap between those thousands of apps, but numbers mattered more. If Atari only allowed games that effectively used their hardware, your Iron Soldiers and Tempest 2000s and DOOMs and Aliens vs. Predator, people (well, the gaming media especially) would have complained loudly about the sheer lack of available games. Games of such quality are hard and time-consuming to make. It was more important and valuable to say "We have nine new games coming out for the 1994 Christmas season" to say "we have three really impressive 64-bit-like games coming out for the 1994 Christmas season." You could say that the core of Bubsy, Checkered Flag, Zool 2, Dragon, Val d'Isere, etc. could be handled just as well on 16-bit systems, but without those "ropey" titles filling the shelves and giving Jaguar owners more options, perhaps the Jaguar would have died a quicker death. However, it's disappointing that Atari thought the higher color depth alone would sway gamers and magazines. Yeah, there's no way the Super Nintendo could display anywhere near as many colors, that's certainly true, but that's not enough of a differentiation to validate the boastful claims of 64-bit power in the jaded eyes of consumers and media. Many people wouldn't even notice, many more wouldn't care. To me, personally, a "ropey" game on the Jaguar (I'm starting to like using that word) was worth more than the same game on the SNES. It might get lost in the noise on the Super Nintendo, but existing on the Jaguar made me pay attention, and money, simply because I was an Atari fan and wanted to bolster my personal library. I got to enjoy a lot of games that I otherwise would not have even considered. It took longer than I had hoped, and ended up longer than I expected, but the Zool 2 episode has been published. Check it out directly, on iTunes/Stitcher/Google Play (within a few hours of this post, typically), or your favorite podcast player. Show notes are on the blog. Thanks to those who sent in feedback, and thank you all for listening. The next episode will cover what is perhaps the best skiing/snowboarding game on the Jaguar, Val d'Isère Skiing and Snowboarding. I'd love to hear any feedback you might have on this one. Episode 17 for Val d'Isère Skiing and Snowboarding is live, available via RSS, iTunes, and Stitcher. The next episode of the podcast is actually going to cover the homebrew title Rebooteroids. You might say I'm trying to delay covering the next two games on my list, Brutal Sports Football and Double Dragon V, and you might be right. Mostly, though, I've got this shiny new transparent cartridge here that I've scarcely played, and that's just sad. So yeah, Rebooteroids next episode. I'd love to hear your feedback on this one, and I've penciled in a deadline of March 18th to guarantee inclusion in the show. No need to send in a rating No-Swear Gamer Scale on this one, I won't be assigning a rating either. 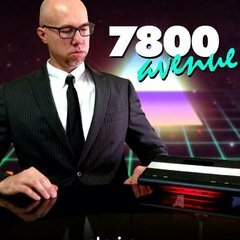 Dauber's reasons for excluding ratings from his Atari 7800 Homebrew podcast convinced me to do the same for homebrew games in my show. I got my copy for Christmas, very cool game indeed. Hi, all, long time no podcast. I won't get into excuses about the delay, but will instead announce that the latest episode, covering the recent Jaguar homebrew game Rebooteroids, is now available! Check it out at the direct link, view the show notes, or simply download using your favorite podcast player (any time now, iTunes). This was a fun episode to put together, and I'm glad I took the detour into homebrew territory. In the next episode, we are back to the regular release chronology with Brutal Sports Football, a game I'm fairly certain I haven't so much as plugged into my Jaguar in the last 20 years. Will it be like visiting an old friend, or has it been left idle for good reason? I'm looking forward to finding out, and to hearing your feedback, if you have any you'd like to share. You may post or PM me here, or e-mail a text or audio submission to jaguar@gamebygamepodcast.com. The Brutal Sports Football episode is out, and to back up that audacious claim I have a link to Libsyn and some show notes, plus you can also check it out on iTunes, your favorite RSS-based podcast player, and probably Stitcher at this point as well. The next episode of the podcast will cover Double Dragon V! If you have any feedback for this one, I'd love to get it in the episode, so post/PM here, or send a text or audio submission to jaguar@gamebygamepodcast.com by October 20th. The latest installment of the podcast, covering Double Dragon V: The Shadow Falls, is now online. Here's a direct link, some show notes, and you'll also find it on iTunes and Stitcher. Even if you don't care for the game, I hope you enjoy the episode. Up next is Pinball Fantasies. If you have any feedback you'd like to share, please post here, PM me, or send a text or audio submission to jaguar@gamebygamepodcast.com. Thanks! The latest episode of the podcast, covering Pinball Fantasies, is out of the launch lane and hopefully not headed for a quick drain. Fire up your flipper fingers, check it out, and as always thank you for listening. The next episode will cover Troy Aikman NFL Football, and if you happen to have any feedback you'd like to share on that one, please send that along, text or audio submission, to jaguar@gamebygamepodcast.com. Thanks! Just what everybody wanted for Valentine's Day: a podcast episode... about an NFL football game... on the Jaguar. Episode 21 - Troy Aikman NFL Football is now available in your RSS-based podcast client, with iTunes and Stitcher following whenever they pick it up. The next episode will focus on Hover Strike, and I've set an arbitrary feedback deadline of March 9th for that one, if you'd like to send something in (please?). Thank you for listening! Episode 22, covering the cartridge version of Hover Strike, has arrived on an unnamed planet near you. Watch out for space pirates. The direct link is at the top of the show notes, and you can also find this episode on iTunes, Stitcher, Google Play, and your favorite RSS-based podcast application. Buoyed by a bunch of great feedback, I think this may be one of my favorite episodes to date. Fire up your Supa Dupa Podcast Playa and check out Cannon Fodder, episode 23, which has now been deployed (using a choppa, of course). Link is in the show notes. The tiles have finally landed in their correct spots, meaning the FlipOut! episode is available for your listening pleasure (or consternation, depending on how you feel about FlipOut!). I was honored and fortunate to have the game's designer Conrad Barski answer a lot of questions about the game, and fill the gaps in FlipOut! 's development story. Check it out through the link at the top of the show notes, or in iTunes, Google Play, Stitcher, or your favorite RSS-based podcast player. The next episode covers the top-down racing game Power Drive Rally. Memories? Opinions? Post here, or e-mail jaguar@gamebygamepodcast.com. Above all, though, thank you for listening! You've paid the entry fees and patched up your rally machine, so now's the time to grab your co-driver and check out episode 25, Power Drive Rally. The next episode will cover Imagitec's I-War! If you have any feedback you'd like to share, please post here, or send a PM or e-mail with text or audio to jaguar@gamebygamepodcast.com on or before December 7th. How can a computer virus collection save the world? Find out in the latest episode of the Atari Jaguar Game by Game Podcast, featuring I-War! Coming up next time is Flashback: The Quest for Identity. I'd love to hear your feedback on this one, whether that's posted here, sent via PM, or e-mailed to jaguar@gamebygamepodcast.com on or before February 23rd.